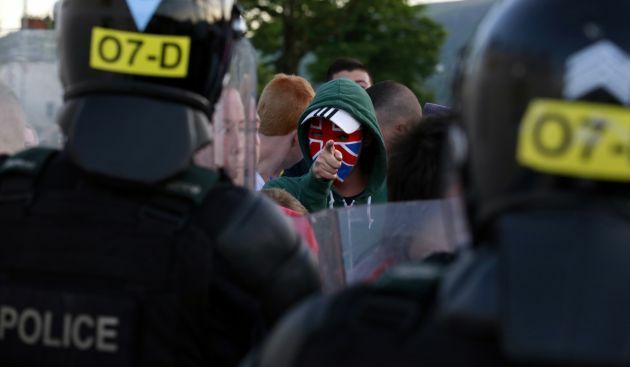 (Photo: REUTERS / Cathal McNaughton)A Loyalist protester gestures to the police in the Woodvale Road area of North Belfast, July 14, 2013, on the third night of unrest after an Orange Parade was blocked from marching past the Nationalist Ardoyne area. Supporters of the Scottish soccer club Celtic heading to Northern Ireland for a European Champions League qualifier have been warned not to wear club colours ahead of the match in Belfast. Officials of the Cliftonville football club urged the visitors to follow safety advice as thousands of Celtic fans were in the Northern Ireland capital for Wednesday's match. The warning followed five successive nights of violence across Belfast, where sectarian tensions are running high between Protestants and Catholics. Celtic is perceived as a Catholic team and its fans would have to walk through areas where sectarian tensions have been running high in recent days. Cliftonville Football & Athletic Club director David Begley was quoted by the Belfast Telegraph as saying Tuesday: "Belfast city center is a very welcoming place but people are very sensitive about colours, not just this week. "As a result, it's probably best to avoid wearing colours into the city centre tomorrow. Celtic FC also advised fans in west Belfast before the game to take taxis to the ground to ensure their safety, instead of walking through sectarian flash points that could be dangerous. The first leg of the UEFA Champions league qualifier has been scheduled in Glasgow, with the second in north Belfast. That would have given more time for any troubles on the July 12, a day when some Protestants celebrate a victory in 1690 against an army led by Catholic Kings James 11. But Cliftonville asked for the dates to be reversed to secure a television deal and guarantee a maximum crowd the Belfast Telegraph reported. Protestant marches through mainly Catholic areas to celebrate the Battle of the Boyne victory hundreds of years ago often trigger sectarian violence as Catholics view the marches as provocative. Celtic Football Club was formally constituted at a meeting in St. Mary's church hall in Calton, Glasgow, by Irish Marist Brother Walfrid in 1887. It served mainly Catholic Irish migrants working in Scotland and has since been viewed as a Catholic team, while its old rival Glasgow Rangers is viewed as a Protestant team by many supporters. Northern Ireland police brought in more than 400 extra officers to prevent violent outbreaks. The Police Service of Northern Ireland said Tuesday that more than 70 police officers had been injured in riots described as "animalistic" linked to a banned Protestant Orange Order parade on July 12 in Greater Belfast. The Northern Ireland police called in their reinforcements from Scotland, Wales and England to help local officers in an unusual move. It was the first time since the British Army withdrew in July 2007 that authorities in the British province have called on outsiders for help in policing. Before 2007 many of those rioting were from Northern Ireland's minority Catholic communities, while much of the recent unrest has taken place in areas inhabited mainly by Protestants. The First Minister of Northern Ireland, Peter Robinson told a special sitting of the province's Stormont Assembly on Tuesday that there was no excuse for the violence. "The one message that this community will be waiting to hear from this Assembly is condemnation of violence, a requirement for people to stand by the rule of law. "I don't think that anybody who takes a ceremonial sword to the head of a police officer can honestly find anywhere more suitable to be than in prison. There is no excuse for anybody carrying out what was an attempt to murder or seriously injure a police officer."